The former site of the Organic Wholesalers (now across the road and up a few shops) has been transformed into Vege2Go, a fresh and exciting new cafe and takeaway that is offering something truly innovative. The kitout is very impressive: the new owners have created a bright and welcoming space, proudly themed on the Italian tricolour. 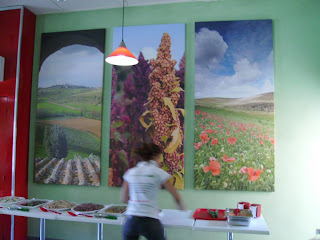 Eyecatching canvas prints of the Tuscan countryside and the quinoa plant adorn one wall. 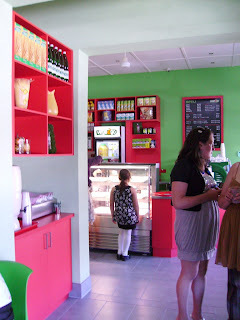 The premise of the cafe is fresh, vegetarian Italian food. The menu is designed with complements: there are mains as well as sides and snacks, encouraging provision of a full meal. The shop is open til 9pm (Mon-Sat), succeeding in that rare venture of providing healthy, inviting and affordable take-home food, at the time when you most want it. Not only is their food accessible, it's also very strong on quality and flavour. The absence of meat is relevant, but no impediment. Instead, a plethora of plant foods are given centre stage: zucchini, eggplant, beetroot, mushrooms, cannellini beans, asparagus, to name just a handful. The savoury side of the menu is divided into Mains, Sides and Snacks, plus Soups and Desserts. Meal Savers encourage customers to mix and match. Of the mains, the three mushroom frittata is extraordinary, with mousse-like eggs enveloping a trio of earthy mushroom flavours. The asparagus and tomato risotto sings with sweet tomato tang. Jumbo-sized mushrooms are filled with pesto and topped with torn bocconcino and a basil leaf. It's incredibly simple but even a meatlover wouldn't be left wanting for protein or 'fillingness'. Aromatic vegie lasagne and parmiggiana are also on offer. It's worth getting a Meal Saver to ensure you sample at least one of the sides. These daily-prepared salads all punch a big flavour hit. 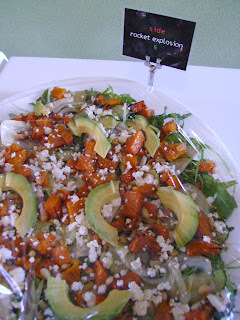 The rocket explosion (above) - featuring the holy combination of rocket, pumpkin, pinenuts and feta - is superb. The pumpkin is perfectly cooked and deliciously seasoned. 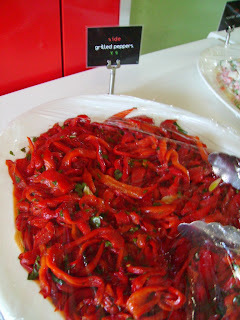 I could happily sit down to a whole tray of grilled peppers (below), doused simply with olive oil, sea salt, garlic and parsley. Other sides include broccoli tossed with garlic and the Mediterranean rice salad, which flies the flag of all that is wonderful about the region, with a mix of antipasto, artichokes, olives, capsicum and brown rice. Desserts on offer include a ricotta tart and vegan chocolate cake. The coffee, from Jasper and hence Fairtrade and organic, is excellently made. Soy, rice and lactose-free milk are all available. Juices, smoothies and Phoenix drinks are also stocked. There are two aspects of this venture that are worth highlighting. One is the quality of produce. This is well-made food, prepared fresh and with love. Secondly, while it is a vegetarian cafe, and that is a strong philosophy amongst its proprietors, nothing is lost in terms of flavour, nourishment nor satisfaction. Glad to read you enjoyed this one so much! I'll actually be blogging our visit myself later today. Those pesto stuffed mushrooms are really something, aren't they?